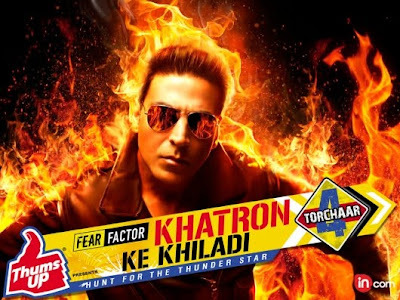 Akshay Kumar is back in the Fear Factor: Khatron Ke Khiladi Season 4 in 2011 that he is going to host it again. After the success of the first 3 edition of Fear Factor. Khatron Ke Khiladi stunt reality show they come back with 13 charming girl participants to fight again its concern in this season of Fear Factor. Khatron Ke Khiladi Last year in 2010 Fear Factor.Khatron Ke Khiladi Season 3 Hottest Bollywood actress Priyanka Chopra host this show in South Africa. Now is the time for beautiful girls to perform their best in Fear Factor. The Khatron Ke Khiladi Season 4 is sponsored by Thums Up, will be hosted by Akshay Kumar.